Una comedia sobre un triángulo amoroso entre dos parientes y una secretaria. 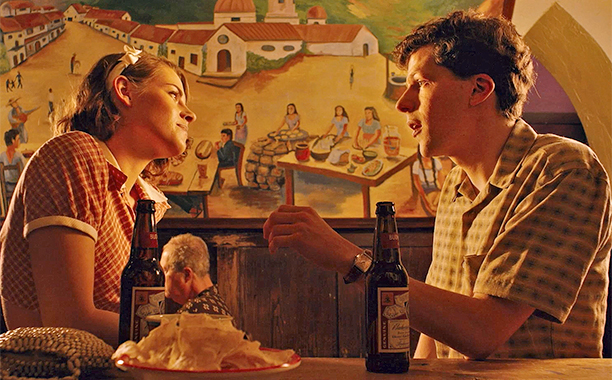 Café Society (2016), una comedia romántica escrita y dirigida por Woody Allen, es la primera película que el famoso director rueda en digital. Protagonizada por Jeannie Berlin (‘Puro vicio’, ‘El rompecorazones’), Steve Carell (‘La gran apuesta’, ‘Como Dios’), Jesse Eisenberg (‘Batman vs Superman’, ‘La red social’), Blake Lively (‘El secreto de Adaline’ ‘Linterna verde’), Parker Posey (‘Hombre irracional’, ‘Superman returns’), Kristen Stewart (‘Crepúsculo’, ‘Blancanieves y la leyenda del cazador’), Corey Stoll (‘Hombre hormiga’, ‘Medianoche en París’) y Ken Stott (‘El Hobbit: Un viaje inesperado’, ‘Las crónicas de Narnia: El príncipe Caspian’). Estrenada por primera vez en el Festival de Cannes el 11 de mayo de 2016, en Estados Unidos el 15 de julio de 2016 y 26 de agosto en España. La película está basada en los años 30. Bobby Dorfman (Jesse Eisenberg), un joven con ganas de comerse el mundo, decide dedicarse a la interpretación. Por ello, se traslada a Nueva York, donde aprovecha los contactos de su tío Phil Stern (Steve Carell), un magnate de la industria cinematográfica. Allí conocerá a Vonnie (Kristen Stewart), la secretaría de su tío, de la cual se enamorará perdidamente; no obstante, lo que no sabe es que Vonnie es la amante secreta de su tío Phil. La comedia hará que todo gire alrededor de Jesse Eisenberg y Kristen Stewart, dos actores que ya han sido visto juntos en otras filmografías como ‘Adventureland’ y ‘American Ultra’. El largometraje tiende a ser una historia relativamente sencilla, cuidando el ambiente, el vestuario y el detalle, con un desarrollo un tanto perezoso a diferencia de otras películas de Woody Allen. Nos habla del amor y de las relaciones, pero sobre todo del destino y de “lo que puede haber sido”. A comedy about a love triangle between two relatives and a secretary. 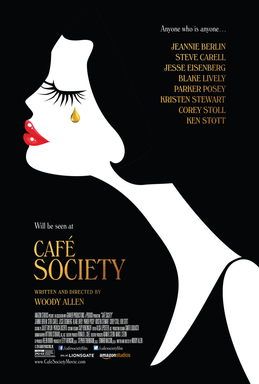 Café Society (2016), a romantic comedy written and directed by Woody Allen, is the first film that the famous director shoots in digital format. Starring Jeannie Berlin (‘Inherent Vice’, ‘The Heartbreak Kid’), Steve Carell (‘The Big Short’, ‘Bruce Almighty’), Jesse Eisenberg (‘Batman vs Superman’, ‘The Social Network’), Blake Lively (‘The Age of Adaline’ ‘The Green Lantern’), Parker Posey (‘Irrational Man’, ‘Superman returns’), Kristen Stewart (‘Twilight’, ‘Snow White and the Huntsman’), Corey Stoll (‘Ant-Man’, ‘Midnight in Paris’) and Ken Stott (‘The Hobbit: An Unexpected Journey’, ‘The Chronicles of Narnia: Prince Caspian’). It has been released for the first time at the Cannes Film Festival on 11th May of 2016, in the United States on 15th July of 2016 and 26th August in Spain . 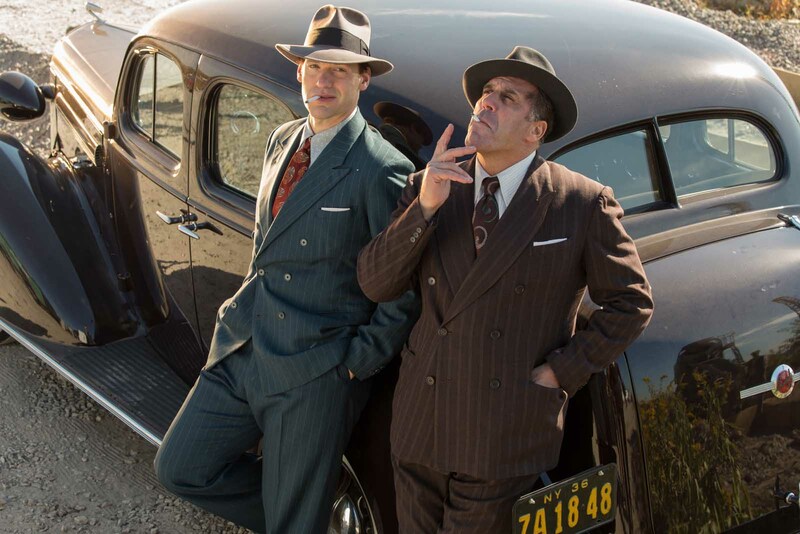 The film is based in the 30s. Bobby Dorfman (Jesse Eisenberg), a young man eager to reach the top, decides to work as an actor. Therefore, he moves to New York, where he takes advantage of the contacts of his uncle Phil Stern (Steve Carell), a tycoon of the film industry. There he meets Vonnie (Kristen Stewart), his uncle’s secretary, who he will be hopelessly in love with. However, what he doesn’t know is that Vonnie is the secret lover of his uncle Phil. The comedy will make everything be about Jesse Eisenberg and Kristen Stewart, two actors that have already been seen together in other filmographies such as 'Adventureland' and 'American Ultra '. The film tends to be a relatively simple story, caring for the environment, wardrobe and detail with a somewhat lazy development unlike other Woody Allen’s films. It is about love and relationships, but especially about fate and "what might have been”.